Kazakhstan has much more to offer than people think. Before I went to this country, most people were quite surprised with the choice of this destination and to be honest, I wasn’t sure what to expect either. I already knew that Kazakhstan is so much more than Borat (and did you know that Borat wasn’t even filmed in Kazakhstan?). During my time in Kazakhstan I realised there are plenty of reasons to visit Kazakhstan. It’s such a hospitable country, with many different religions and ethnics that all live together in harmony. 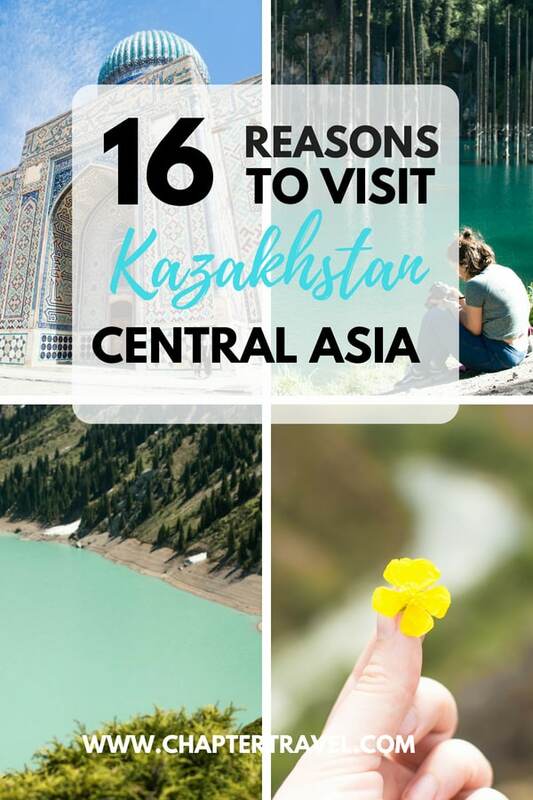 Below I share 16 reasons to visit Kazakhstan. During my visit in Kazakhstan, I had only positive experiences with the local people and found the people in Kazakhstan to be very hospitable. The country is so multicultural with so many different religions without any issues, because the people are so accepting of others. The Russians and Kazakh people live together in harmony, no matter what happened in the past. We also felt very welcome everywhere we went. If you don’t like touristy places, visit Kazakhstan. It’s not a popular tourist destination at all (yet), so you don’t even have to try to avoid tourists. 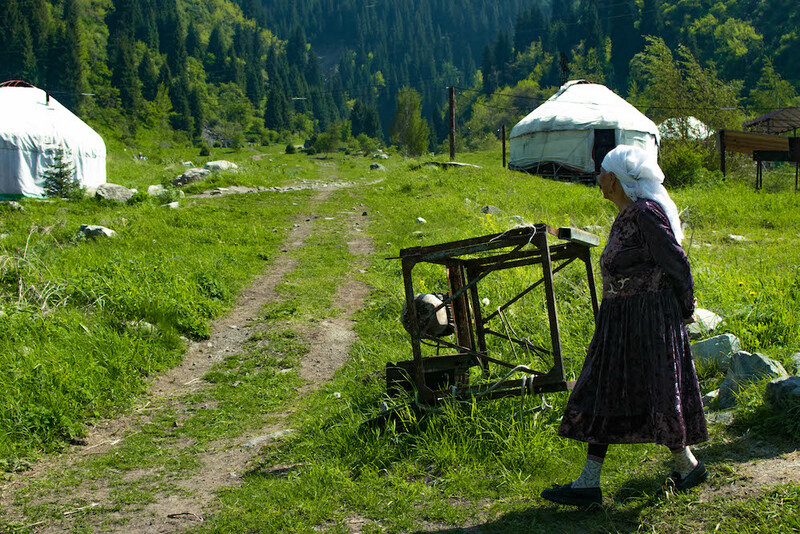 Kazakhstan is a huge country, so it’s perfect for those that love some solitude. It’s refreshing to visit popular tourist attraction and only encountering two other people, or sometimes even nobody else at all. As already mentioned earlier, Kazakhstan is a very multicultural country with people from all around the world. It’s actually one of the most multicultural places I’ve ever been and the country is home to 126 ethnic groups. The two groups that are the biggest are Kazakh and Russian, because of the, actually rather sad, history of Kazakhstan. From 1936 to 1991 Kazakhstan used to be the Kazakh Soviet Socialist Republic, one of the transcontinental constituent republics of the Soviet Union. In the 1930s up to 40% of the Kazakhs died of starvation or fled the country. Eventually, Kazakhstan was home to almost every ethnic group that had ever come under the Russian sphere of influence. The Kazakh people are so accepting of others, and the country is a religiously and ethnically diverse country that embraces tolerance as a cultural value. Ukrainians, Uzbeks, Germans, Tatars, Koreans and more, most of them with their own languages and religions (the official languages of Kazakhstan are Kazakh and Russian). You might think that Kazakhstan is only a land of deserts and steppes. Even though this is definitely true for a big part of the country, there is more to Kazakhstan’s landscape! The amazing landscape in Kazakhstan was one of the main reasons I wanted to go there. Luckily, I wasn’t disappointed at all! Think of beautiful mountains, lakes, deserts, canyons, the endless steppe… All the unspoiled nature in Kazakhstan is incredible. 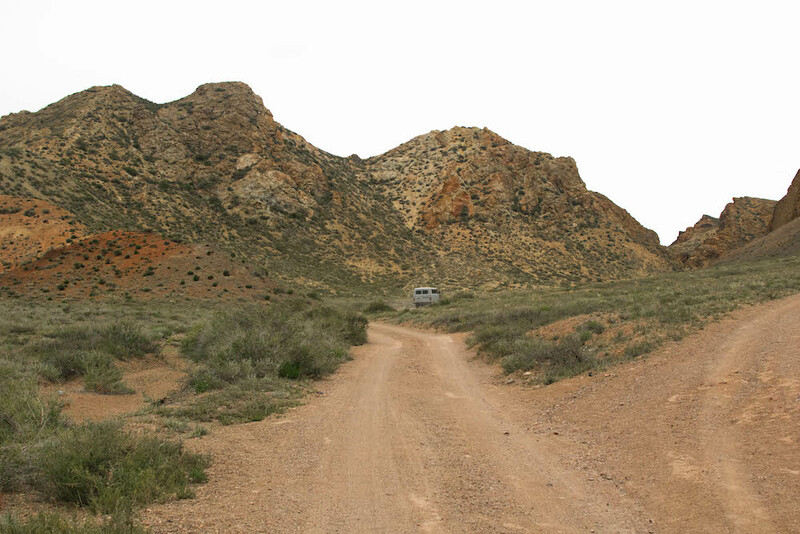 Altyn-Emel National Park covers 4600 square kilometers and has a lot of interesting places to explore. It houses various unique landscapes, archeological, historical and cultural sights and rare and endangered species of animals and plants. 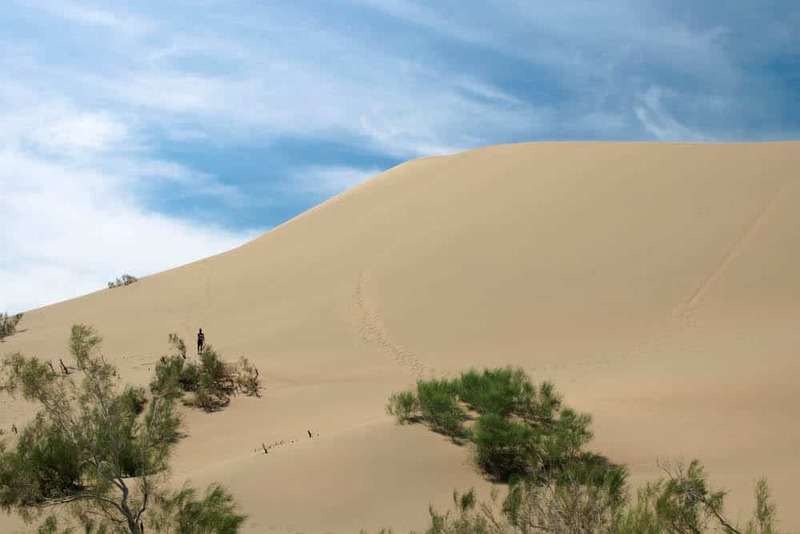 Some of the highlights of Altyn-Emel National Park include: Aktau and Katutau hills, Terekty petroglyphs, the 31 Besshatyr burial mounds (one of the biggest groups of Scythian tombs known), Turanga forests and the famous Singing Dune. The Singing Dune hums like an aircraft when the weather is windy and dry, hence the name! Like mentioned above, Kazakhstan is really more than just deserts and the steppe. There are some incredible lakes to explore too! One is Kaindy Lake, which you can see on the featured image of this article. Close to Kaindy Lake you can find the beautiful Kolsai Lakes. The Kolsai Lakes is a system of three alpine lakes, sitting on altitudes between 1700 and 2650 meters. 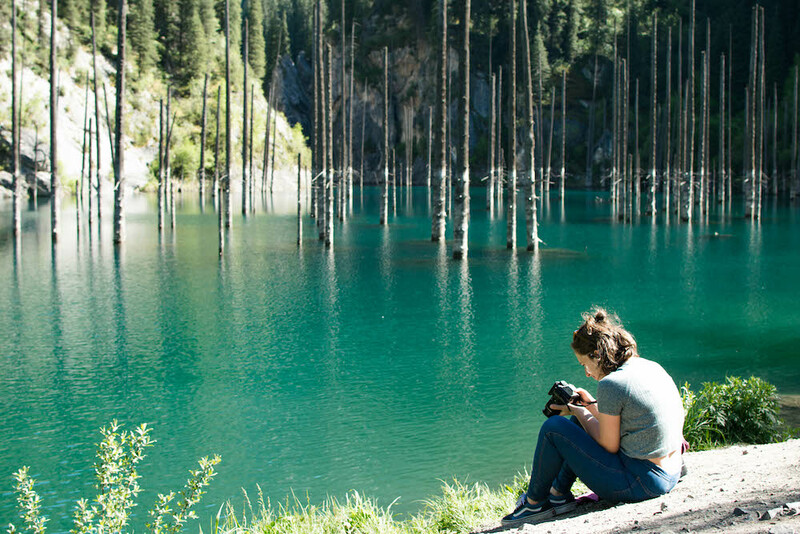 The lakes are incredibly clear and lie in a perfect forest, surrounded by cliffs and the hills of Northern Tien Shan Mountains with snowy caps and wooded slopes. The three lakes are pretty much located on the same line. The first lake (pictured above) is located at an altitude of 1700 meters and to get to the second lake you have to climb higher in the mountains, as it sits on an altitude of 2500 meters. The third lake is the highest of the three, and sits on an altitude of 2700 meters high. Even if you don’t like hiking or driving for hours, you can still fully enjoy the nature in Kazakhstan. 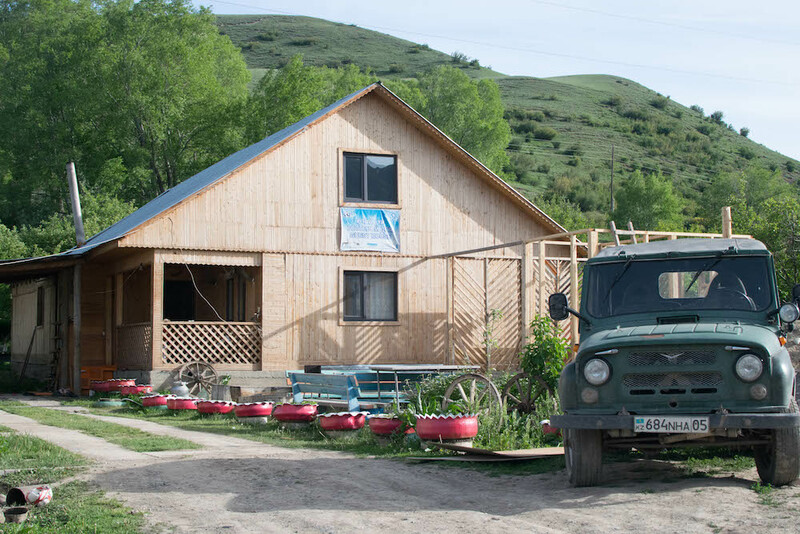 There are plenty of great day trips from Almaty. 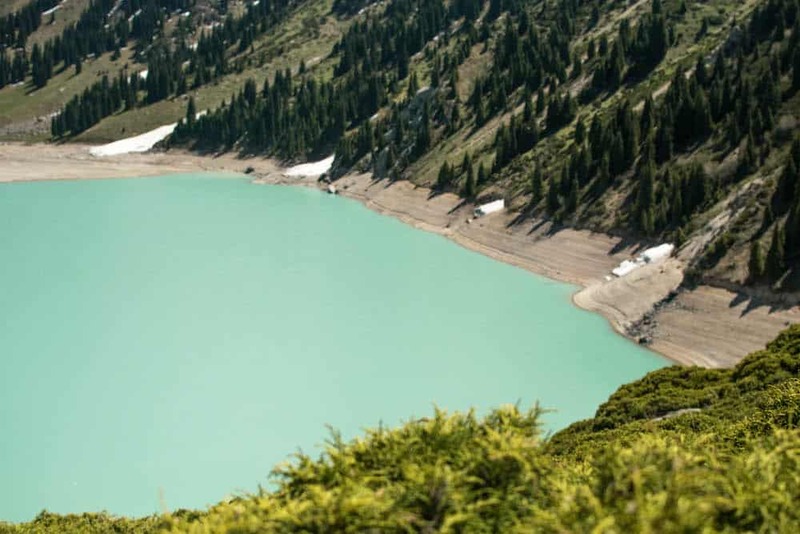 For instance, Big Almaty Lake can be reached from the Almaty city center in just 30-40 minutes by car! 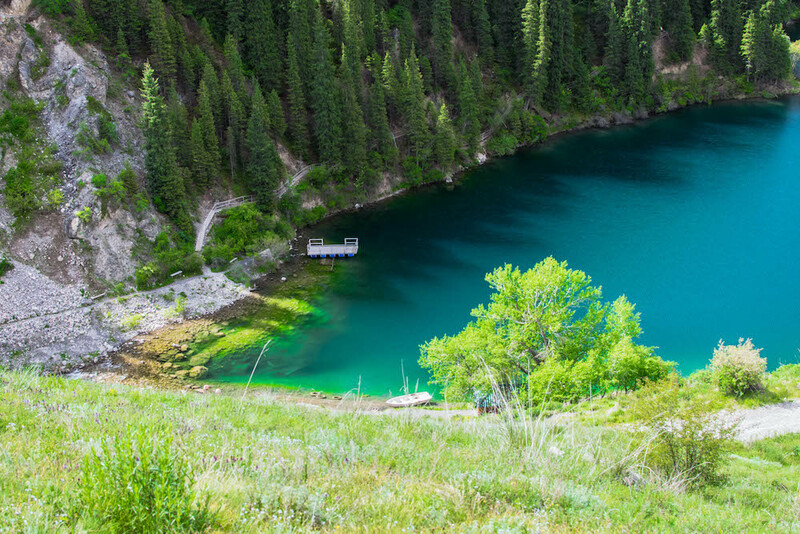 The lake sits at 2500 meters above sea level in the Big Almaty Gorge. What makes this lake special is that the colour changes depending on the weather and the time of year. During our visit the lake had a deep turquoise colour, but it can also have an emerald green hue. The surrounding forest makes it even more spectacular. 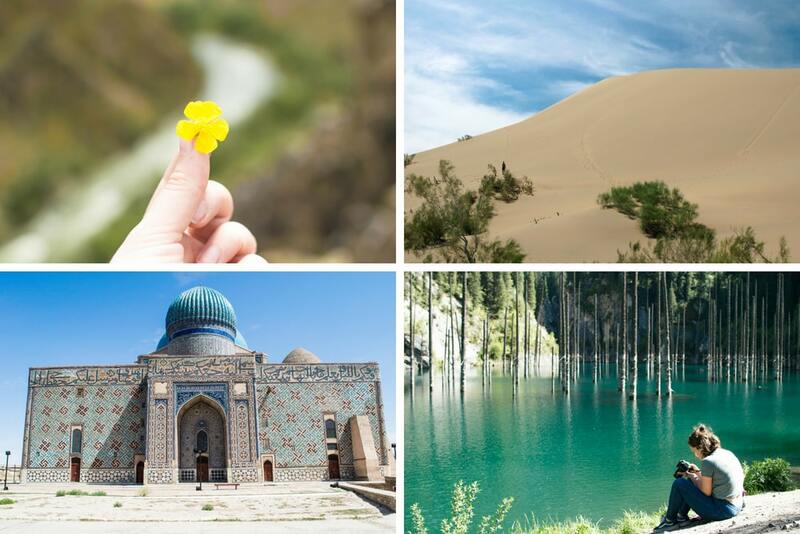 Check out our two week itinerary for Kazakhstan and find more day trips from Almaty! If you’re into shopping, then Almaty and Astana are perfect destinations for you. I think I’ve never been to so many malls in my life! One of the most famous places to shop in Kazakhstan is Khan Shatyr Entertainment Center. Khan Shatyr is a big, 150 meter high, transparant tent that covers 140.000 m². In the tent you can find a shopping and entertainment center with a food court, a cinema, minigolf course, a park and an indoor beach resort. Yes, there is actually a beach! The Sky Beach is an exclusive aqua park with sand and tropical plants. The microclimate of the beach resembles that of a natural marine climate, so summer never ends at Khan Shatyr! 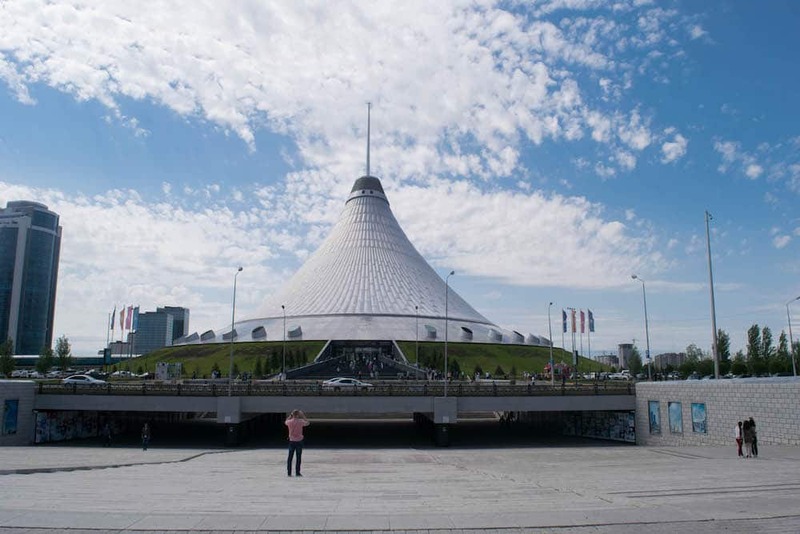 Find more things to do in Astana in this article. Yes, Kazakhstan is huge! But did you know that it’s actually the 9th largest country in the world? It also used to be the second largest republic in the former Soviet Union. It’s not a surprise that the landscape in Kazakhstan is so diverse! 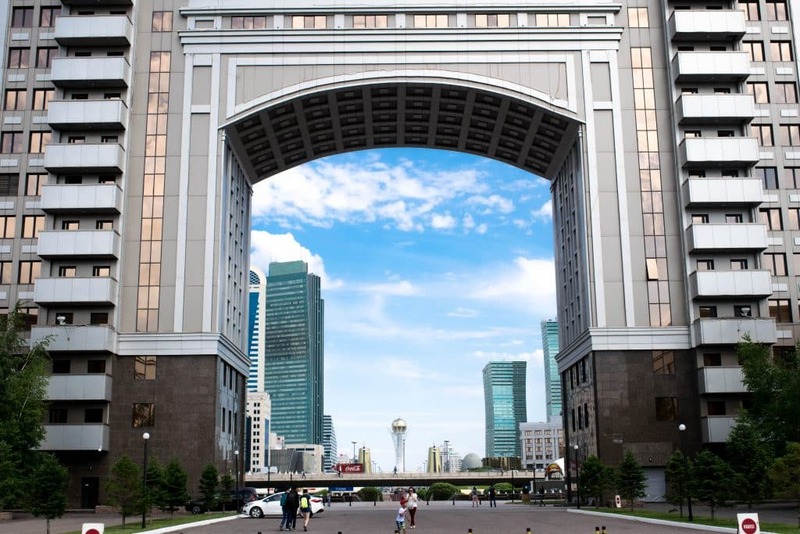 Kazakhstan is actually the most economically developed country of the five Central Asian countries. The country has transitioned from a lower-middle-income to a upper-middle-income status in only two decades. This is mostly because of the oil that is found in the country. Mostly in the cities you’ll be surprised to see how developed and modern everything is. There are also quite a lot of expats in Almaty and Astana. Now, of course this isn’t necessarily a reason to visit a country, but with the development comes a bit of comfort. Such as trendy restaurants and good hotels! Above you can see the delicious risotto and cheesecake that we had at The Shoreditch Burger & Wok in Astana, which was sooooo good! Because Kazakhstan is so multicultural, there are all types of food to try! During our visit we had Kazakh, Korean, Italian, Russian, Japanese and Indian food. Best of all was that it wasn’t expensive it all ;). Astana and Almaty also offer plenty of accommodation possibilities, from hotels and hostels to airbnb. If you haven’t used Airbnb before, use this link for a discount! In the more remote towns you’ll mostly find guesthouses and the like. The hostels and guesthouses we stayed in were all comfortable and clean. If you rather try out local food in Kazakhstan, this is definitely possible. More specifically, if you’re travelling in towns and places outside of the cities, you probably don’t even have a choice! When we were in guesthouses in the middle of the steppe of Kazakhstan, the hostess prepared our meals and we couldn’t exactly just pick something from a menu. 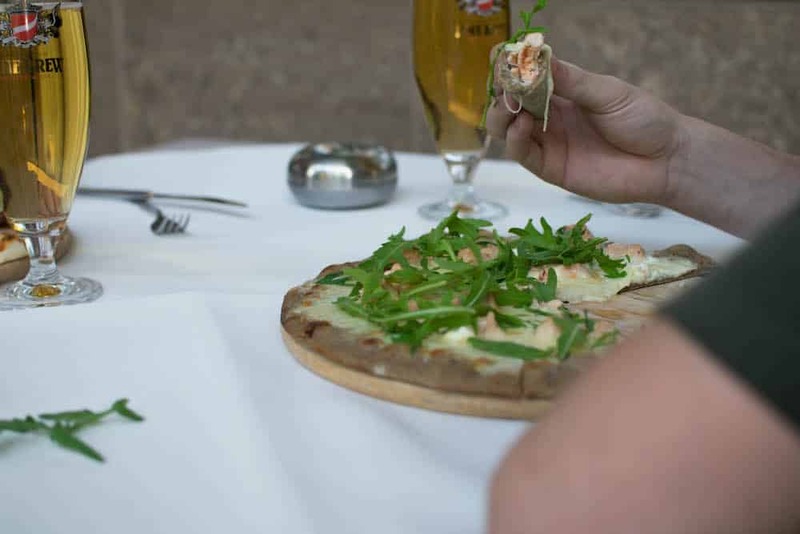 But also in the cities you can easily find restaurants with local food. 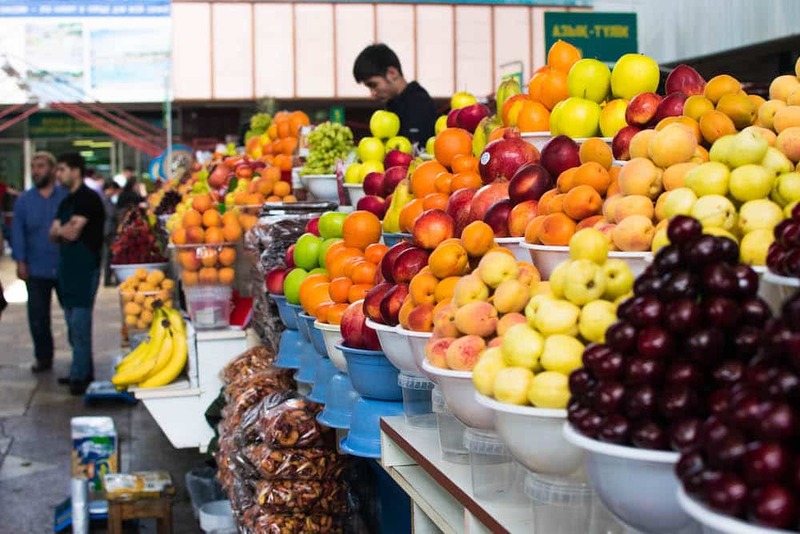 Another possibility is to visit the Green Market in Almaty. This is a large, two-level traditional market. At this market you’ll finally feel like you’re in Central Asia, and you can browse around all the different products. At the various stalls you can find nuts, spices, fish and meat. But also fermented horse- and camel’s milk, or perhaps a bit more to your taste: freshly squeezed pomegranate juice. It’s really easy to get around Kazakhstan, especially between the main cities. We personally travelled around by car and train in Kazakhstan. 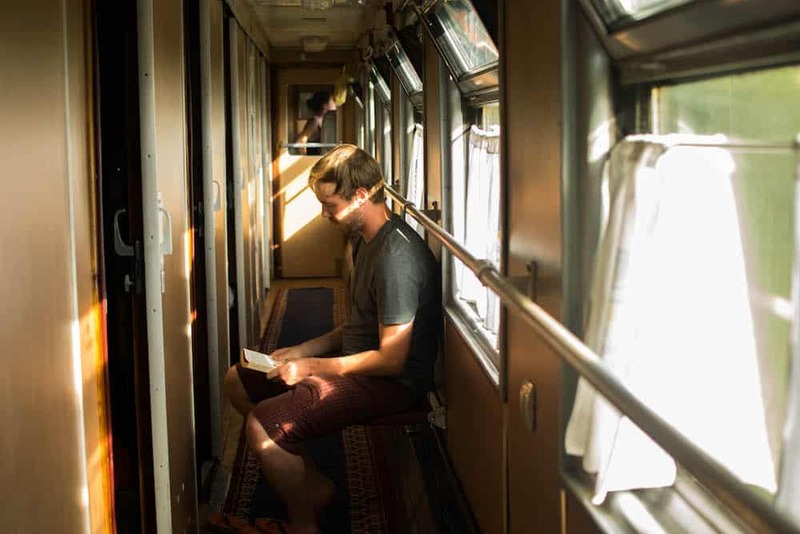 The railway in Kazakhstan is excellent and the main centers are all very well connected. If you’re travelling by car and going to remote places, you definitely need a 4×4 wheel drive, as the roads can be rather bumpy. I recommend a driver if you’re not experienced with a 4×4 wheel drive. 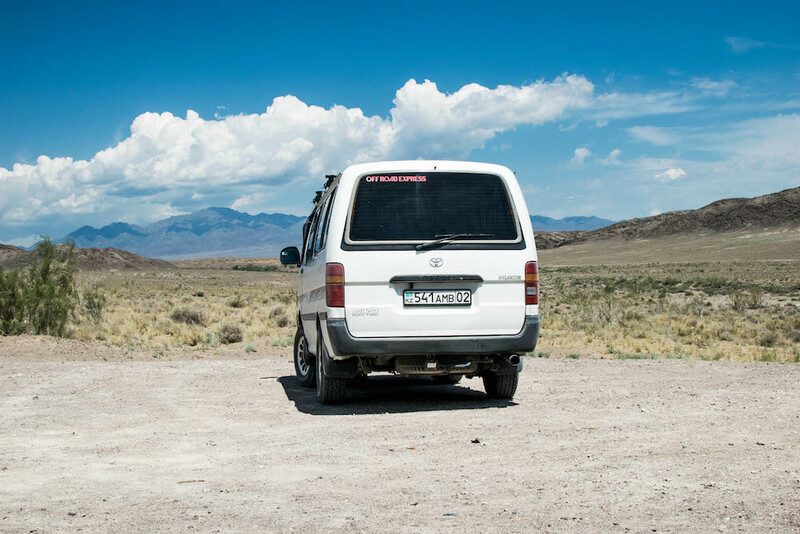 Not only is Kazakhstan perfect for adventurers, it’s also perfect for budget travellers! Even though it’s such a big country, it’s really affordable to travel from one destination to another. There are also plenty of accommodation possibilities, such as hostels, in most cities. You can get a dorm bed for about 4-10 euros a night and a double room for about 6-12 euros. In the smaller towns there are less options, but most places that are near a tourist attraction offer guesthouses that are around 5 euros a night. Also, eating out is really affordable. Especially if you eat local food, you barely have to spent any money: for about 3 euros you can already get a meal. 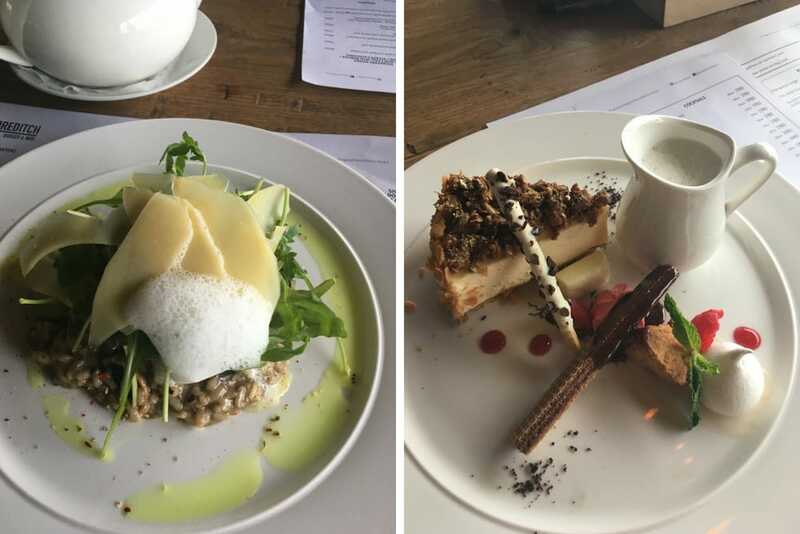 If you’re a bit like me and you rather eat in a more ‘modern’ restaurant, then you’ll pay around 10-15 euros for a meal. 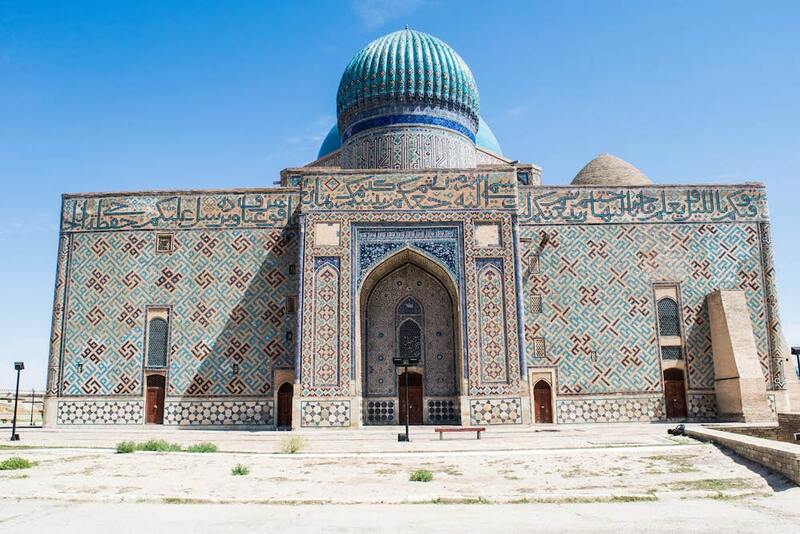 Turkistan in Kazakhstan is a relatively well preserved 1600-year-old city where you’ll find ancient mausoleums, archaeological sites and other fascinating human creations. It’s definitely worth a visit in Kazakhstan and it was one of the highlights of my trip. 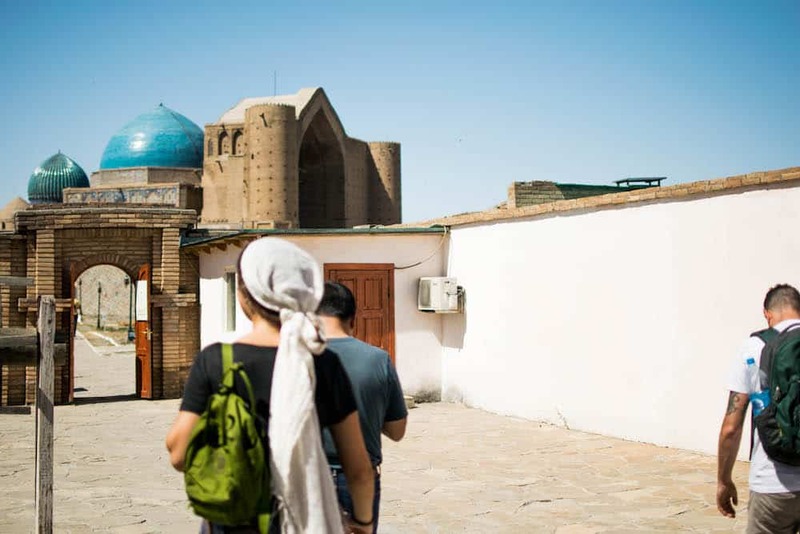 Find out more about Turkistan in this short guide I wrote. One of the highlights of my travels in Kazakhstan was the visit to the Mausoleum of Khoja Ahmed Yasawi in Turkistan. It’s Kazakhstan’s greatest architectural monument and most important pilgrimage site. 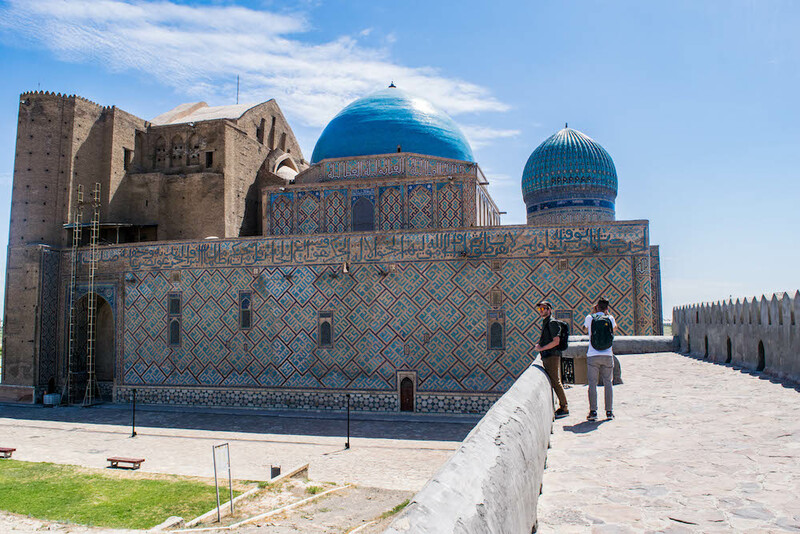 The mausoleum is dedicated to the first great Turkic Muslim holy man, Kozha Akhmed Yasaui and was built by Timur in the late 14th century. Even though this building is unfinished, as Timor died before it was completed, it’s still one of the most beautiful mosaic work you’ll ever encounter. Have I already convinced you to visit Kazakhstan?! Let us know if you have any questions or comments in the section below. Stunning photos! Kazakhstan has been on my radar, and I will be doing the Trans Siberian in a couple of years, so I might try to combine it in with that trip. It looks like a really incredible place. Thank you for taking the time to introduce this awesome country. It’s refreshing to hear about another country that doesn’t make me think “again” (sorry #Bali_overdose) I would definitely be interested to visit this country’s natural wonders. Much thanks & safe travels! Unfortunately Borat did a number on my pre(mis)conception of Kazakhstan, and it’s obvious that it warrants a closer look! The scenery looks beautiful and nice to know the locals are friendly and it’s budget friendly, at least for now. I have always been curious about visiting Kazakhstan and your post has inspired me to look further. Well done. This is exactly what i wanted to read! Kazakhstan has been climbing my chart of countries to visit. Could you tell me the approximate expenses of visiting here? Thanks for educating us about Kazakhstan. I think most people know it from Borat, hehe. A Finnish actor actually filmed an episode there on his series going through the former Soviet countries. It seemed a very interesting place already then to me. Kazakhstan is a great country. I was there last year and agree with all of the reasons. What an amazing country – I have heard more and more about this recently and it really intrigues me. Thank you.